Happy Thanksgiving! For your holiday approval, with contributions from the Depression Era to World War II Collection of the Library of Congress American Memory site: my own personal "Thanksgiving Pilgrims Progress." Get the food. 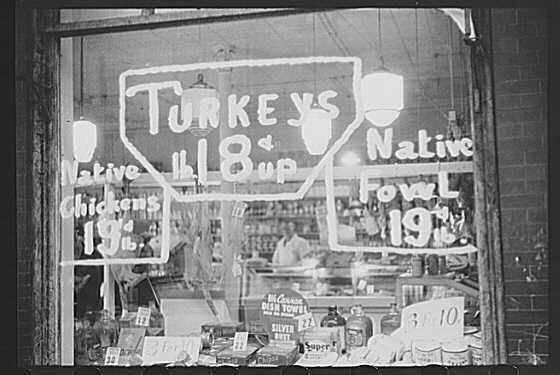 Don't you wish these 1940 prices were still around? Eat the food. Big crew! Speaking of rest, due to all the craziness of the holidays, I'll be taking a brief break from the daily Shuffle posting for a week, but I'll be back; and there will still be a few posts next week. 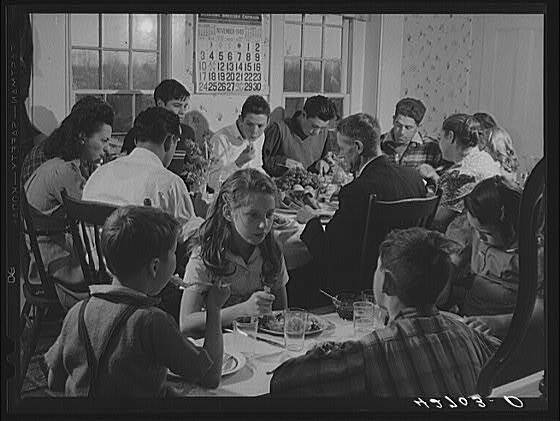 I hope you have a happy and safe start to your holiday season. I was feeling nostalgic, so I decided to take a stroll through the drawings at patentroom.com, where I came across this 1934 LaSalle design by General Motors' resident genius, Harley Earl. For those who don't remember, LaSalle was a companion brand to Cadillac from the late 1920s into the early 1940s. Three great film noir detective stories air Tuesday on Turner Classic Movies. Two feature different versions of Philip Marlow, two are shot from the main character's perspective, and two feature the ultimate tough-guy/babe combination of Bogey and Bacall. All that in only three movies. A special treat is Lauren Bacall singing "And Her Tears Flowed Like Wine" in The Big Sleep. From the Internet Archive, a 1937 Fleischer studios short that reminds me of some later Warner Bros. classical music-inspired animation: A Car Tune Portrait. After last weekend's Lindy Hop workshop and variety of various dance opportunities, the Red Hot Lindy Hop resumes its regular, weekly dance lesson and session tonight at the Rumba Room. Free dance lesson at 7:00 p.m. with Kimmie and Jaredan, followed with music by special guest DJ Willow until 9:30 p.m. Salsa at 9:30 p.m. 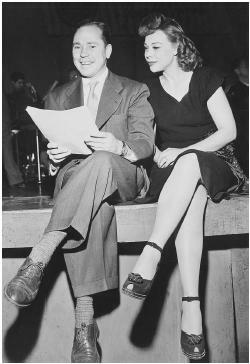 Happy 100th Birthday Johnny Mercer! On November 18, 1909, Johnny Mercer was born in Savannah, Georgia. To say his songwriting career was prolific is a massive understatement. 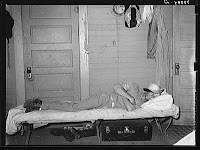 He wrote hit songs from the 1930s through the 1960s, including "I'm An Old Cowhand" (1936), "G.I. Jive" (1944), "Satin Doll" (1958) and "Charade" (1963). Remember "Moon River" from Breakfast at Tiffany's? Happy Birthday Johnny! P.S. 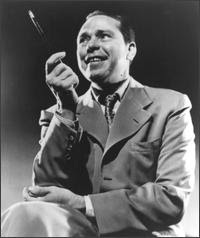 - The Swing Shift Shuffle will feature an all Johnny Mercer playlist tonight, so tune in at 6:00 p.m. Central on either 89.9 FM or wevl.org. If you ever hear anyone complain that the lyrics of "today's" music are unintelligible, bear in mind the very popular 1940's song featured in this soundie. From the Internet Archive, indisputable proof that there were always songs with silly lyrics: The Hut Sut Song. 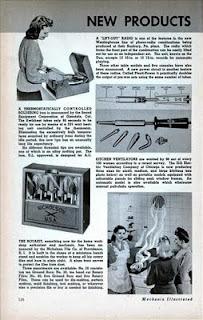 Since Thanksgiving is less than two weeks away, why not get started on your Christmas shopping early with some of the wonderful new products featured in this 1946 Modern Mechanix article. For the music lover, the second page includes a 10 ounce, 3x6x3/4 inch pocket radio with earphones. Bear in mind this was 60 years before the iPod, and it used actual radio tubes. This 1941 Superman short from the Internet Archive provides a brief origin story for the man of steel, in addition to the usual adventure. Turner Classic Movies is airing a nice variety of films tomorrow, including the following four classic gems. 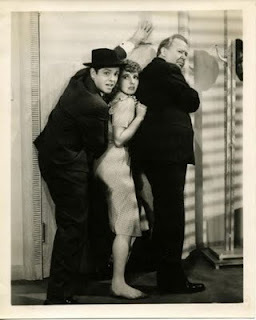 I have not The Fighting Sullivans, but I can vouch for the others as excellent; from the British Empire adventure of Gunga Din, to the patriotic wartime espionage suspense of Saboteur, to the feel good, socially conscious cuteness of Jean Arthur in The Devil and Miss Jones. Playlist for November 11, 2009 - Veterans' Day Pledge Drive Special! It seemed fitting to observe Veterans' Day (a/k/a Armistice Day or Rememberance Day) by posting a documentary about my home town's most famous aircraft, The Memphis Belle. This film is not the 1990 feature of the same name, but rather an account of an actual bombing mission, using actual combat footage shot during the run, and directed by William Wyler (director of Mrs. Miniver, Ben Hur, Roman Holiday, and many other Hollywood classics). Put on your dancing shoes this weekend. In addition to the usual, weekly Red Hot Lindy Hop dance lesson and session this Friday at the Rumba Room, the Red Hot Lindy Hop presents Joel Plys and Evita Arce for a Lindy Hop Workshop in Memphis on November 14 and 15. See full schedule and register at redhotlindyhop.com. Free dance lesson at 7:00 p.m. with Becky and Mike, followed with music by DJ Becky until 9:30 p.m. Salsa at 9:30 p.m. The BBC reports about a British woman who discovered some amateur movie footage shot by her grandfather while he was as a Spitfire pilot in the RAF during World War II. As we approach Veterans' Day (a/k/a Armistice Day or Rememberance Day) on November 11, this seemed like an appropriate item to post. Note that the British historian interviewed in the piece is wearing his red, Rememberence Day poppy on his lapel. Although the UK maintains that tradition, it was an American woman who actually started it. If some of the early cartoons seem a little odd by today's standards, bear in mind that animation was a relatively new art form, so almost everything was an experiment of some sort. In addition, the common presumption that cartoons were just for children did not yet exist, so some of these shorts were directed as much as adults as kids. That might explain why several of the characters in this 1931 version of Red Riding Hood from the Internet Archive are smoking cigarettes. Another interesting point is that the two primary characters are blatant, and I mean BLATANT, copies of Walt Disney's Mickey Mouse. The historic, 157-year old Elmwood Cemetery, where many famous and infamous figures in Memphis history rest (including swing band leader Jimmie Lunceford), is hosting a lunch and lecture about the Tuskegee Airmen on Wednesday, November 11, 2009. Admission is $10, and you can register at the Events page on Elmwood website. 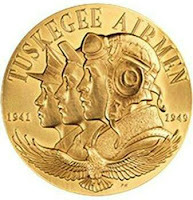 The Tuskegee Airmen refers to all those involved in the "Tuskegee Experiment", a program implemented by the Army Air Corps to train African Americans to fly and maintain combat aircraft. 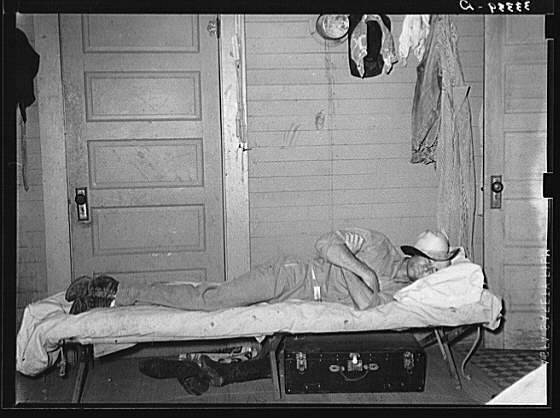 Nearly 1000 men graduated from the program, and over 450 were deployed oversees with the 332 Fighter Group of the Army Air Corps. Overcoming segregation and discrimination, the Tuskegee Airmen became one of the most highly respected fighter groups of World War 2 and paved the way for full integration of the United States military. This program is presented by Mable Barringer. Remember, in addition to the usual, weekly Red Hot Lindy Hop dance lesson and session this Friday at the Rumba Room, there is an upcoming Lindy Hop Workshop on November 14-15. Free dance lesson at 7:00 p.m. with Amanda and Jaredan, followed with music by DJ Alexis until 9:30 p.m. Salsa at 9:30 p.m.
Plus, Red Hot Lindy Hop presents Joel Plys and Evita Arce for a Lindy Hop Workshop in Memphis on November 14 and 15. Cost $65 until November 6, with discounts for students. See full schedule and register at redhotlindyhop.com. Boing Boing recently introduced me to an interesting military history site called All World Wars, which features historic magazines, propaganda posters, training and weapons manuals, paintings, pamphlets, scholarly treatises and other historical artifacts ranging from an Italian Renaissance sketchbook on military art to photos from the 2008-2009 Israel-Gaza war. 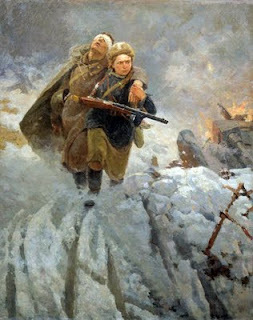 The item that I first encountered was a collection of Soviet paintings from World War II. Very powerful images, such as this one entitled Sister. I know it may seem like I am a shill for Turner Classic Movies, but honestly, I just really like old movies, and TCM's uncut, no commercial format. At 7:00 p.m. (CT) this Wednesday, November 4, TCM will air its original documentary Johnny Mercer: The Dream's On Me, featuring archival footage and new clips that trace the career of the great American songwriter. Just a little later than night, at 10: 49 p.m., TCM will air one of its "One Reel Wonders" entitled Symphony in Swing, in which Artie Shaw, his orchestra, and Helen Forrest perform five tunes.